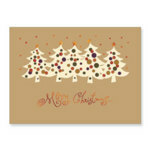 We have 100s of different style Christmas cards here at C L Promotions which include our Branded CCA Christmas cards. You choose which card you prefer from our massive calalogue of different Christmas scenes and we'll see to printing a signature of your business details and company logo. So keep your business advertised this Christmas on our Branded CCA Christmas cards, and show your customers that you're thinking of them, increasing repeat business and encouraging customer loyalty. Other promotional and personalised items besides our Branded CCA Christmas cards click here. Find out more about our Branded CCA Christmas cards by clicking here.